In January 2009 the School of Education, University of Western Sydney decided to appoint an e-learning officer with the aim of improving the quality of online learning environments across course units. The e-learning officer had built a strong relationship with 45 academics across two campuses, with a positive impact on the application of university e-learning basic standards improving look and feel, information architecture, usability and accessibility of online units. Academics successfully integrated technological tools such as slidecasts, Google Docs, digital video and blogs into existing curricula and teaching contexts. This translated into an enhanced learning experience for our students. Significant aspects of the success of this experience included the provision of high quality educational design, empowerment of staff to experiment, staff development via workshops and one-on-one support, development of resources for academics to facilitate online teaching and learning, training of students in the use of technological tools, and strong focus on their learning experience monitored by reflection and research. We believe morale has increased in the School, especially in relation to online teaching, since the appointment of the e-learning officer. People seem to be more connected, are more open to change, and enthusiastic about trying new things, and are learning more about technology and what is available to them. There is more awareness about holistic approaches to online learning and how websites affect the student experience. We believe we have created significant attitudinal change. Reyna, J. (2016). Implementing E-learning Across the School of Education: A Case Study. 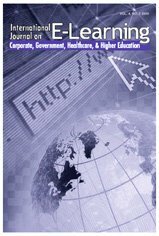 International Journal on E-Learning, 15 (1), 101-120. Waynesville, NC USA: Association for the Advancement of Computing in Education (AACE). Retrieved April 25, 2019 from https://www.learntechlib.org/primary/p/41947/. Buckingham, J. (2005). Good Teachers Where They are Needed. Issue Analysis 64. Chu, S., Kennedy, D., & Mak, M. (2009). MediaWiki and Google Docs as onlinecollaboration tools for group project co-construction. Proceedings of the 2009 International Conference on Knowledge Management [CD-ROM]. Hong Kong, Dec 3-4, 2009. Creswell, J.W. (2002). Educational research: Planning, conducting, and evaluatingquantitative and qualitative approaches to research. Upper Saddle River, NJ: Merrill/ Pearson Education. Grodeka, K., Wild, F., & Kieslinger, B (2008). How to Use Social Software in Higher Education. ICamp. Vienna. Holzner, S., & Holzner, N. (2009). Google docs 4 everyone. FT Press. Hibbert, R. (2008). Safely Share Google Spreadsheets With E-Mail Forms. PC World 26(9): 121-121. Judd, T., Kennedy, G., and Cropper, S (2010). Using wikis for collaborative learning: Assessing collaboration through contribution. Australasian Journal of Educational Technology 2010, 26(3), 341-354. Kaplan, S. (2002). Building communities: Strategies for Collaborative Learning Circuits. Distance Learning 4(2): 81-96. McPherson, V. (2009). Practical Applications of Web 2.0: Bring your Community Together. Knowledge Quest 37(4): 62-63. Smith, R. (2000). The future of teacher education: theory and practice. Asia-Pacific Journal of Teacher Education 28(1). Spanbauer, S. (2007). Comparing Collaborative Web Services. PC World 25(12): 61-62. Stigler, J.W. And J. Hiebert, Eds. (1999). The teaching gap: best idea from the world’s teachers for improving education in the classroom. New York, The Free Press. Tashakkori, A., & Teddlie, C. (Eds.). (2003). Handbook on mixed methods in the behavioral and social sciences. Thousand Oaks, CA: Sage Publications. Uys, P. (2010). Implementing an open source learning management system: A critical analysis of change strategies. Australasian Journal of Educational Technology, 26(7), 980-995.